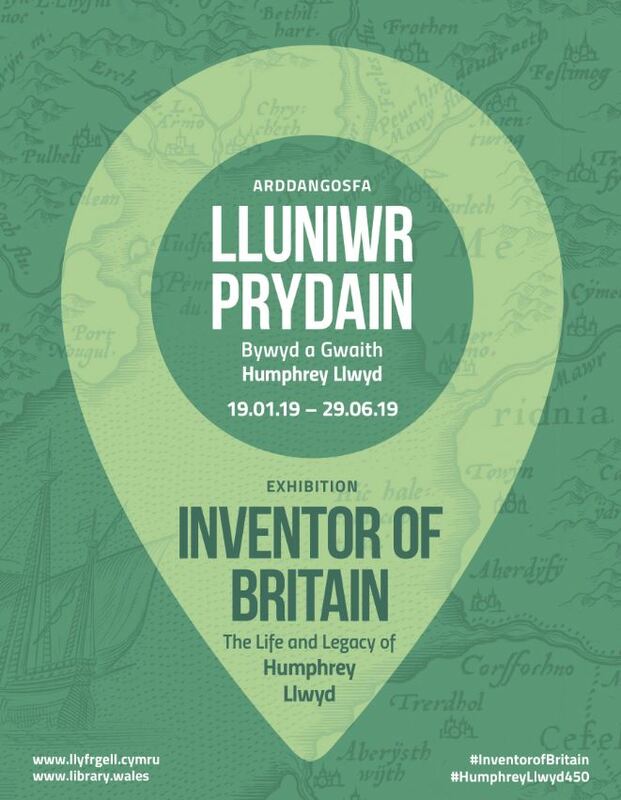 January 19th sees the opening of the Library’s latest exhibition: Inventor of Britain – The Life and Legacy of Humphrey Llwyd. This exhibition is the latest in a series of events to mark the 450th anniversary of the death of Humphrey Llwyd, the author of the first published map of Wales. Last August to coincide with the actual anniversary a smaller exhibition was held for two weeks, but this larger exhibition will be on for the next six months. While Llwyd is probably most famous for his map of Wales, in addition to being the father of Welsh cartography he is also considered to be the father of Welsh history as a result of his Cronica Walliae the first history of Wales in English based on the ancient Welsh chronicle the Brut y Tywysogion. This would be enough of a contribution in itself to ensure the legacy of most people, however in addition to this Llwyd was also responsible for helping to steer the Bill for the Translation of the Bible into Welsh through Parliament, thus leading to the Welsh Bible which was a major factor in helping Welsh to survive as a language. 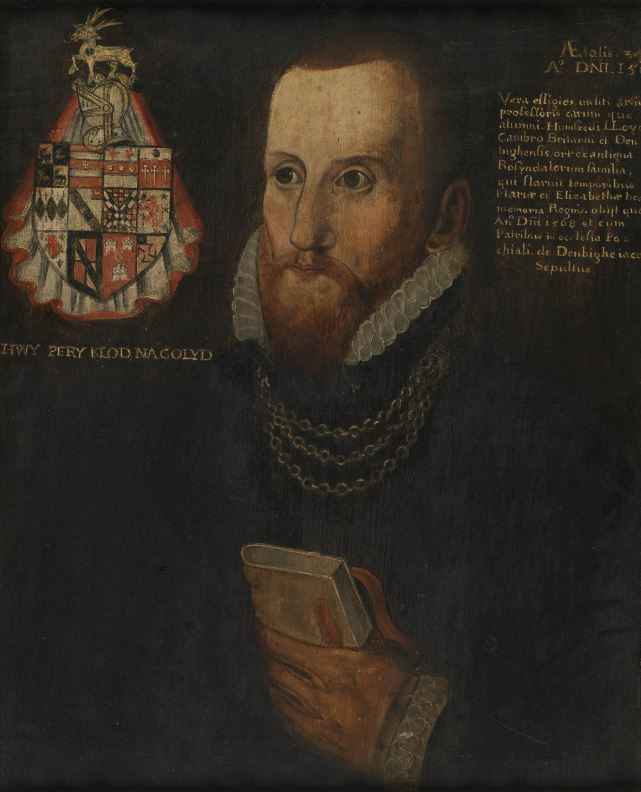 But Llwyd’s influence goes beyond the borders of Wales; his works were also used to help justify the British Empire (a phrase he is credited with coining) and the English reformation. Part of his extensive library was purchased by the Crown and now forms part of the collections of the British Library. This new exhibition is being held in association with the AHRC funded project Inventor of Britain: the complete works of Humphrey Llwyd. A number of lectures will be given over the coming months by members of the project team and this year’s Carto-Cymru – the Wales Map Symposium will also be on the theme of Humphrey Llwyd. The exhibition runs until the 29th June and further details of the associated events can be found on the Library’s website. 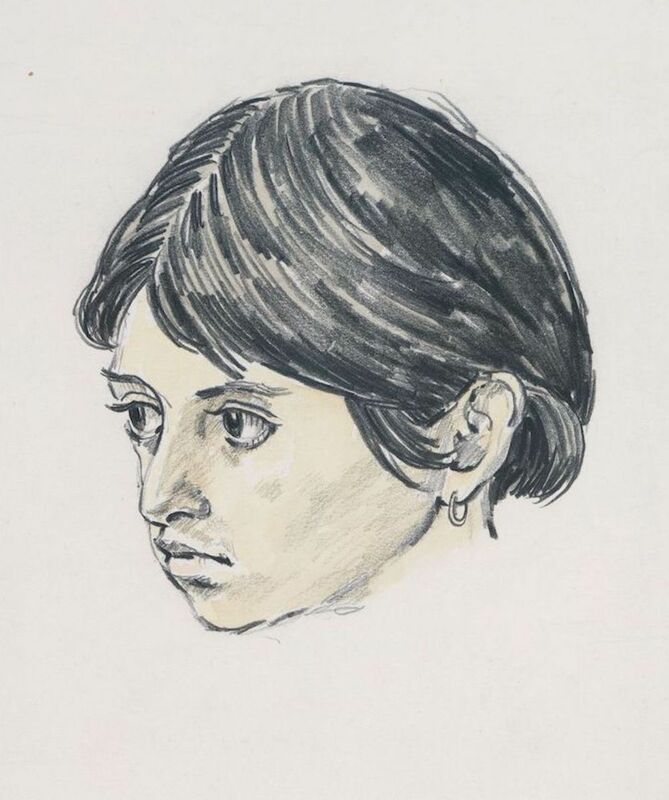 A refined and beautiful talent: thoughts on the centenary of the death of Morfydd Owen (1891-1918) is the title of Dr Rhian Davies’s presentation at the Drwm on 11 September. This is a significant date as it marks a hundred years since her burial at Oystermouth cemetery. 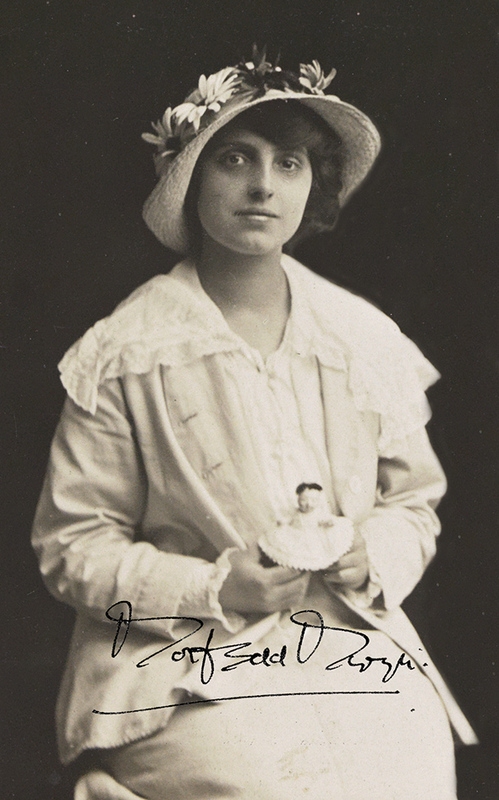 Morfydd Owen composer, singer and pianist, died tragically young on 7 September 1918 aged twenty six. The presentation is one of many centenary events organised by G?yl Gregynog Festival to celebrate her life. Dr Rhian Davies is the Festival’s Artistic Director and the chief authority on the composer who was also the subject of her thesis for her doctorate degree at Bangor University in 1999. 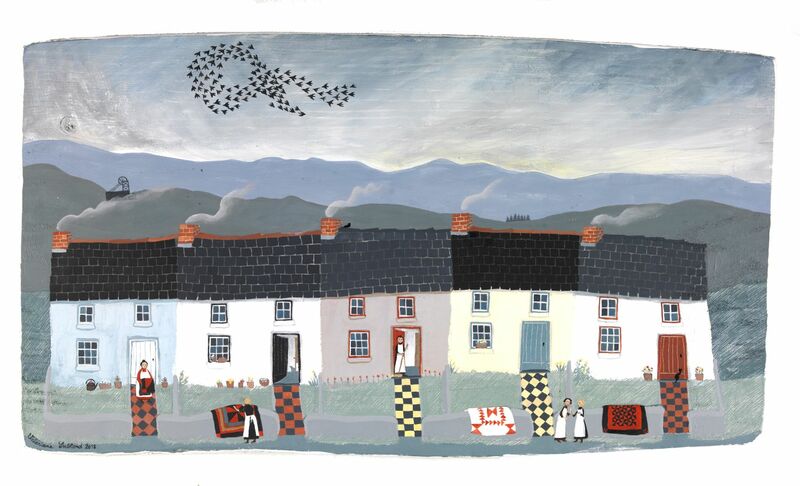 Morfydd Owen was born on 1 October 1891 in Treforest in a musical household. She won a scholarship to study music at Cardiff University with Professor David Evans in 1909 and was awarded a Mus. Bac. degree in 1912. Afterwards she studied composition at The Royal Academy of Music, London, 1912-1917, and won numerous awards, including the Charles Lucas Silver Medal for composing ‘Nocturne’, an orchestral work. In 1918 she was elected an Associate of the Academy. She was inducted into the Gorsedd at the National Eisteddfod at Wrexham in 1912 under her bardic name ‘Morfydd Llwyn-Owen’, an amalgamation of her name and her father’s home Plas Llwyn Owen, Bontdolgadfan, near Llanbrynmair. A sensitive performance of her song ‘The lamb’ was given in the Blue Riband competition at the recent National Eisteddfod. Morfydd Owen was very talented as she had a rich mezzo-soprano singing voice, was an accomplished pianist and could compose in a variety of styles ranging from hymn-tunes to orchestral pieces. A scholarship was set up in her name at Cardiff University after her death and Grace Williams was the first to be awarded in 1923. The manuscript scores and personal memorabilia of Morfydd Owen are housed at the Special Collections and Archives, Cardiff University. A drama-documentary was shown in 1991 by S4C on the centenary of her birth and a film Morfydd will be premiered this Autumn on the channel. It focuses on the relationship between Morfydd Owen and Dr Ernest Jones who she married in a Registry Office in London after a brief courtship. The script is by Siwan Jones. Rhian Blythe who plays ‘Morfydd’ spent some time at the Library researching for her role. A small exhibition of items from the Library’s collections will be on display in the Summers Room on 11 September to complement the talk on Morfydd Owen. 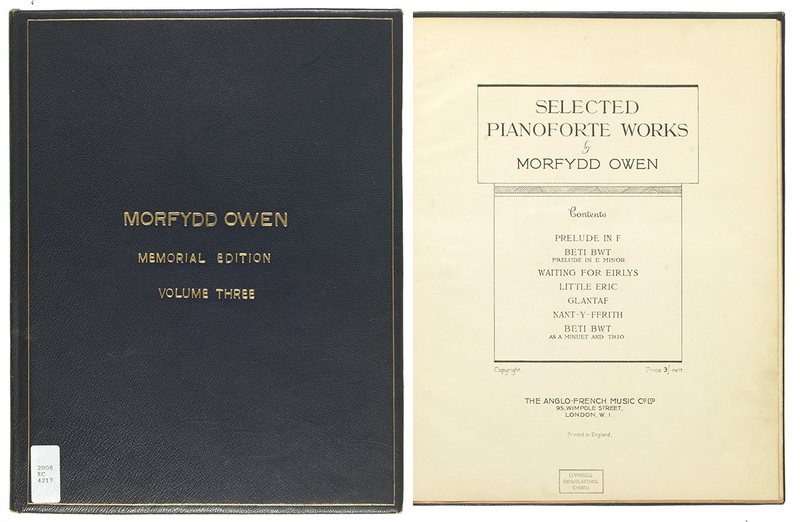 Included are music manuscripts, letters in her hand, photographs, concert programmes and the two memorial editions of Morfydd Owen’s posthumously published works inscribed by Dr Ernest Jones to his father-in-law William Owen. 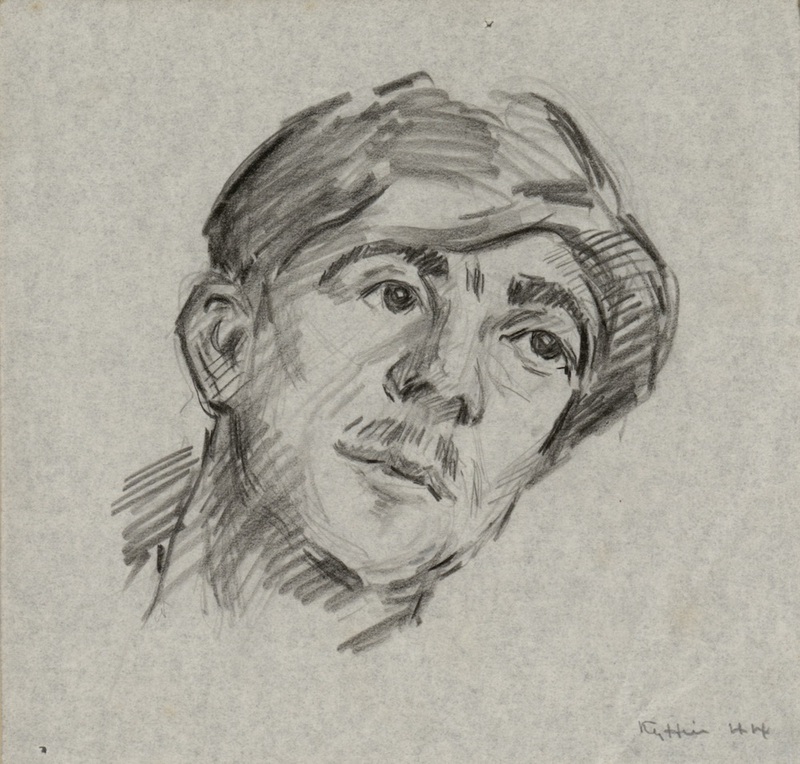 Kyffin joined Highgate School in north London in September 1944. Much of the School had previously been evacuated to Westward Ho! in Devon but art had not been on the wartime curriculum so a teacher was needed on return to the capital. 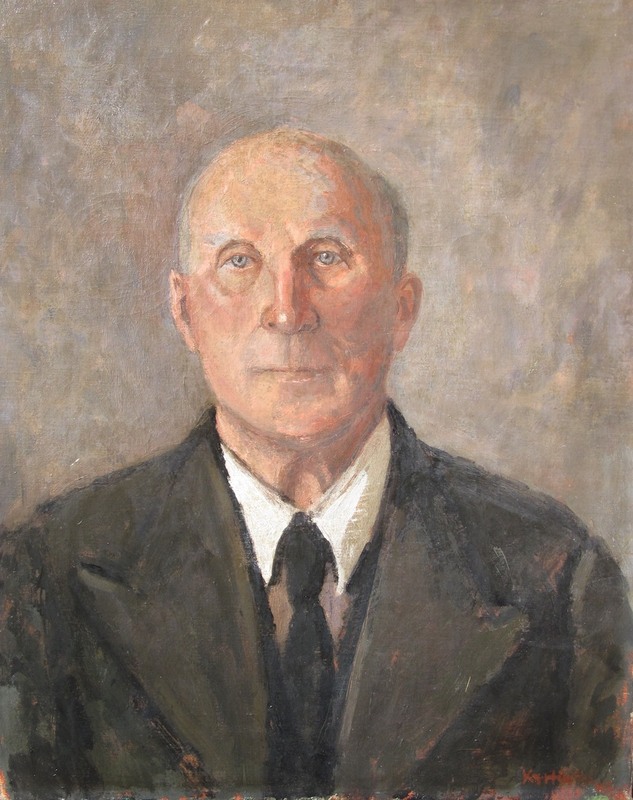 After working full-time (six days a week) for the first two years, Headmaster Geoffrey Bell suggested that Kyffin should find a colleague to share the job so that he could do more of his own painting and so the elusive William Cole, a friend from the Slade days, took over half of his timetable. Cole only lasted a couple of years though. Kyffin soldiered on alone for a further twelve months but his epilepsy wasn’t under control, so on the advice of his doctor and with the agreement of the School Governors he was awarded a sabbatical from the summer of 1949. This provided an opportunity to start travelling and in 1950 he visited Italy, the first of many trips abroad during the ensuing decade. His replacement was another acquaintance from the Slade, Antony Kerr, whose wife was the artist Elizabeth Rendell. On his return to Highgate Kyffin taught alongside Antony for nine years. Tom Griffiths, mentioned in ‘A Wider Sky’ and yet another Slade graduate, was tempted into teaching for a year, as subsequently was CF Ware. Then stability returned as Kyffin’s former pupil Anthony Green (1951-56) joined the Art Department in 1961 at the age of twenty-one. 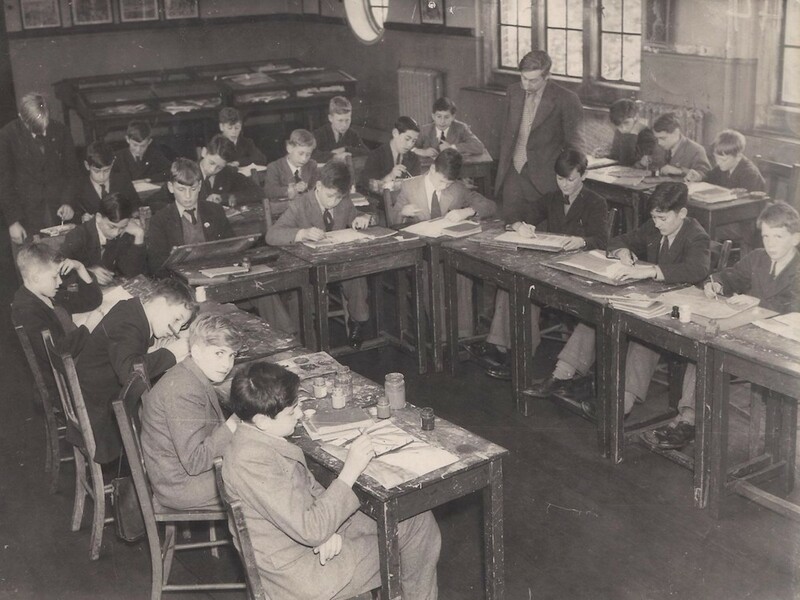 He was the last of the ‘Slade brigade’ to help Kyffin out – A Dear and JL Lowe from the Royal Academy Schools were his ‘other halves’ from 1968 until his retirement in 1973. Patrick Procktor, who had also studied under Kyffin from 1948-52 chose not to enter the profession. By the time Kyffin returned to Anglesey in 1974 a full-time Director of Art, Gordon Tweedale, had been appointed in his place. Of course Kyffin had enjoyed another six months off in 1968-9 to travel to Welsh Patagonia on a Churchill Fellowship, an event that was probably responsible for his being nominated to be an Associate of the Royal Academy in 1969 and elected the following year, following an unsuccessful first attempt in 1961. His becoming a full Academician four years later was proof, if any was needed, that he could finally make a living as an artist. Kyffin had first been accepted at an RA Summer Exhibition as early as 1946, though it wasn’t until 1959 that his work became an annual feature for almost forty years. 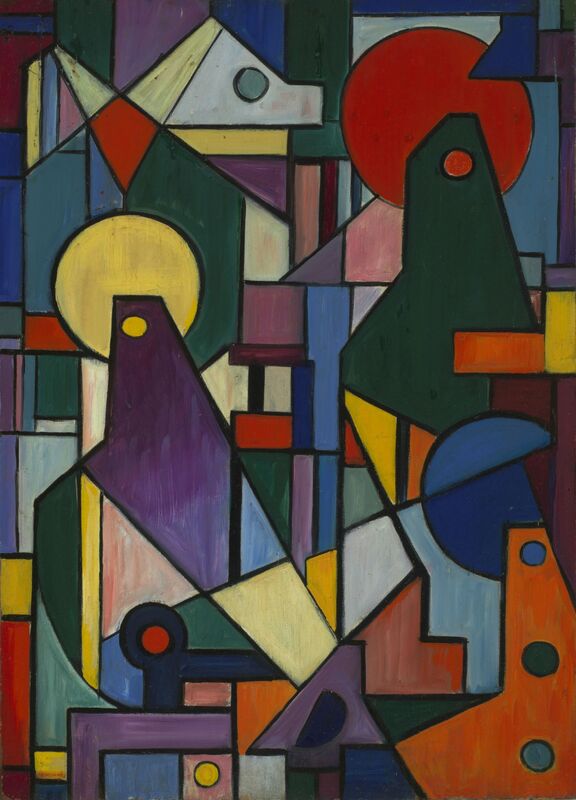 His first show in a commercial gallery was at Colnaghi’s in 1948 and the Leicester Galleries were soon representing him too. It wasn’t until after he had left Highgate that the Thackeray became his main promoter in London. Kyffin lived in or close to Highgate for his first twelve years in London, most famously as a tenant of Miss Mary Josling on Bisham Gardens in Highgate Village, a period that is vividly described in ‘Across the Straits’. During that time he recorded many local scenes and personalities, such as the former School cricket coach and groundsman Albert Knight. Albert, in his seventies when Kyffin painted his portrait, had played for England in the 1903-4 Ashes series in Australia, which was won by the visiting side. Brief residencies in Hampstead followed, including a stay with Fred and Diana Uhlman on Downshire Hill, before he spent a few years further west in Holland Park. 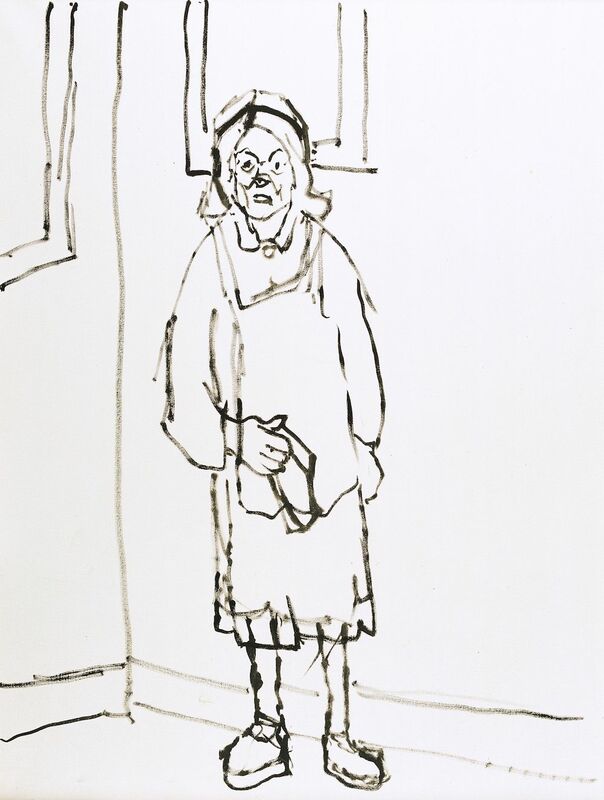 When his artist friend David Smith moved from Finchley with his wife Elizabeth Hawes, Kyffin occupied one of the flats that they had created in their house for a year before learning that 22 Bolton Studios near the Fulham Road was vacant from Jane Richards, and old acquaintance from North Wales. The eight years he spent on Gilston Road, his last London address, also received a colourful rendering in his first volume of autobiography. To mark Kyffin’s centenary and celebrate his ‘London years’ to some extent, two exhibitions under the banner ‘Kyffin Williams: Paper to Palette Knife’ are planned in Highgate in the autumn – one at the Highgate School Museum on Southwood Lane and a second in the Gallery of the Highgate Literary and Scientific Institution (HLSI) on Pond Square. The former will feature the School’s collection of oils alongside paintings borrowed from private collectors and small loans from the National Library of Wales and Oriel Môn on Anglesey; while the HLSI will be displaying a substantial loan of (mostly) works on paper from the NLW. Together the two exhibitions will possibly constitute the largest ever retrospective of Kyffin’s work to be shown in England. They will run concurrently from 14th September to 7th October with opening times: Tuesday to Friday 1-5pm, Saturday 11am-4pm and Sunday 11am-5pm. On Monday 10th September at 7 pm I will be giving a lecture about Kyffin’s London years at the School. Tickets can be booked online nearer the time here: https://www.ticketsource.co.uk/highgateschool Then on Friday 21st September at 8 pm Rian Evans, co-author of ‘Kyffin Williams: The Light and The Dark’, will be giving a talk at the HLSI. Tickets can be booked by e-mail: admin@hlsi.net or by phone: 020 8340 3340. Kyffin Williams’ emotive seascapes which are on display in the artist’s centenary exhibition here at the National Library, should be celebrated in their own right and stand apart from the artist’s other more well-known works. Kyffin’s highly expressionistic style within these monochrome works manages to convey the movement and the violence of a storm at sea in in a tremendously effective manner, reflecting the artist’s own hidden inner turmoil. Kyffin’s connection to Trearddur Bay, which is located on the west coast of Holy Island off the coast of Anglesey where many of these seascapes were based can be traced back to the artist’s childhood. As a young boy of six years old who would turn 7 the following week he was sent to Trearddur Bay Boarding School in May 1925. He stated in his memoir ‘Across the Straits’: ‘It did not take me long to fall under the spell of the island’s mood. The storms, the sea mists, the wrecks, the wailing sirens, and in summer the peculiar haze that hung over the island, all made Trearddur Bay a very special place’. 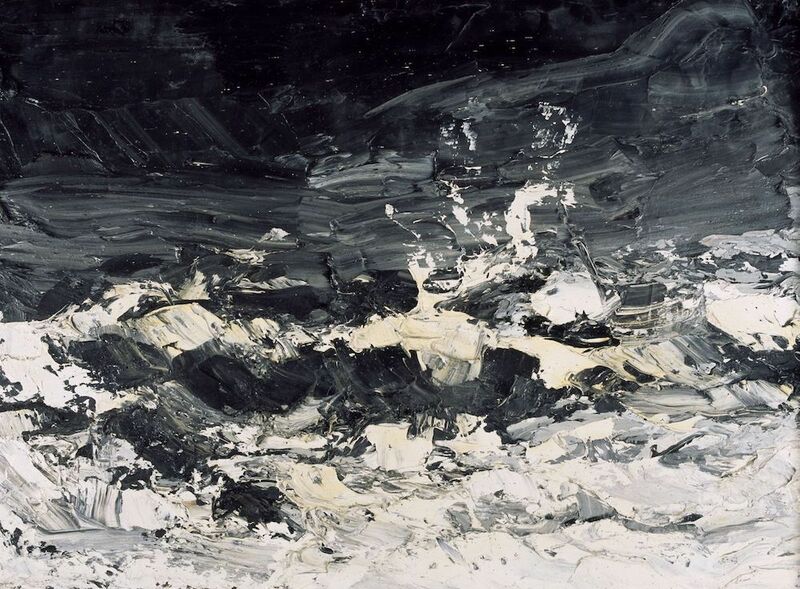 As the authors Rian Evans and Nicolas Sinclair stated in the recently published work, ‘The Light and the Dark’ on Kyffin’s life, the artist who had suffered with the afflictions of epilepsy and depression throughout his life acknowledged that he expressed his most turbulent feelings through his seascapes. In an interview in 2000, the artist stated that it was due to his battle with epilepsy that he felt a need to apply strongly contrasting colours down onto the canvas, as can be seen in these seascapes. He stated: ‘It might be part of the epilepsy, the excitement – the epileptic shock of dark against light, it’s very exciting you see. Van Gogh was an epileptic and he had the same love of contrast’. Inspired by other notable palette knife users such Gustave Courbet and Van Gogh, Evans and Sinclair also saw a parallel within Kyffin’s seascapes to other iconic works such as Hokusai’s ‘The Wave’ and August Strindberg’s dramatic seascapes. The artist would return to paint the subject throughout his life. 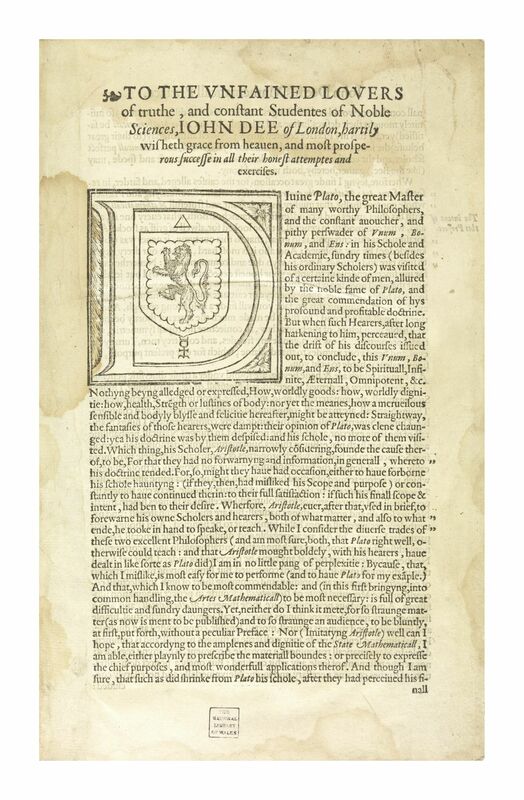 As part of the Seeing Euclid network of exhibitions throughout the UK, the National Library of Wales will display an example of their valuable Euclid collection of books from 7 July to 27 August. The project aims to highlight the legacy of Euclid’s Elements in the early modern period in Britain and Ireland, with displays of books and artefacts from the period. It is curated by the research project Reading Euclid, based at the University of Oxford and funded by the AHRC. 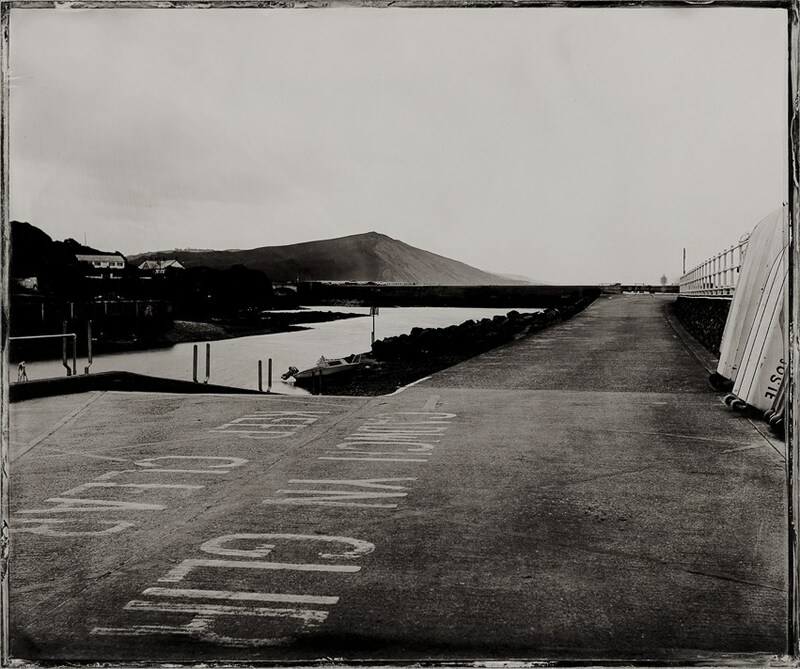 The exhibition is a collaboration between nearly thirty institutions across Britain and Ireland. He compiled the thirteen books of The Elements while working in Alexandria in the third century B.C. His work describes the foundations of Mathematics and dominated the subject for over two thousand years. He developed the concept of logical proof, in which theorems are proved, directly or indirectly, from axioms. The Library has a large collection of books authored by Euclid. It consists of 270 editions of Euclid’s work which were published from 1484 to 1800. The original collection of 39 volumes was given to the Library by Sir Charles Thomas-Stanford in 1927 and an addition of 11 volumes in 1928. Since then the Library has continued to add to the collection. 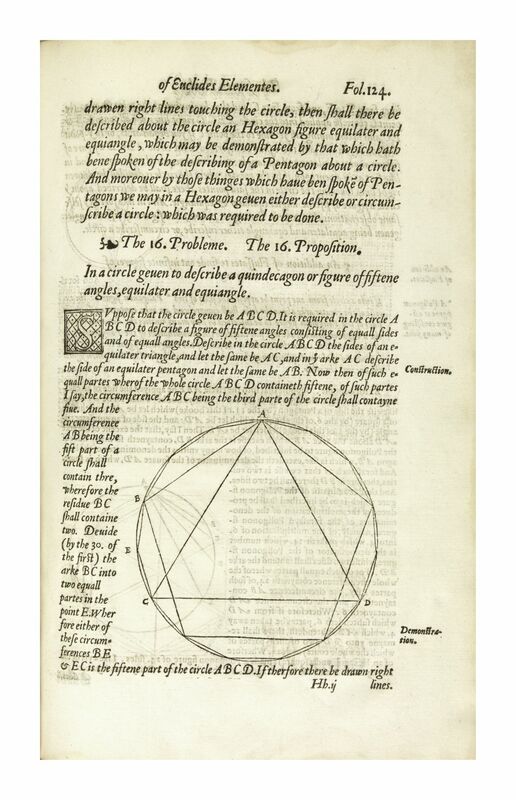 An example of a page from "The Elements of the Geometrie of the most auncient Philosopher Euclide... with a preface by John Dee" published in 1570. 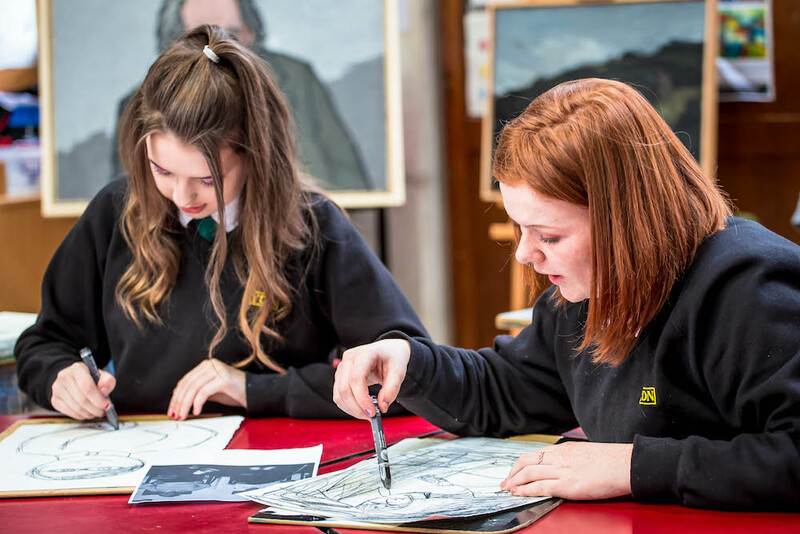 As part of the Kyffin Williams centenary celebrations, the Library’s Education Service has been delivering many activities for schools, colleges and families, based on one of Wales’s most recognised and popular artists. During the year free workshops will be delivered to primary and secondary school pupils to coincide with the Library’s main exhibition Kyffin Williams: Behind the Frame, and a bilingual booklet focusing on Kyffin’s life and work is being distributed free of charge to all who take part in the workshops. 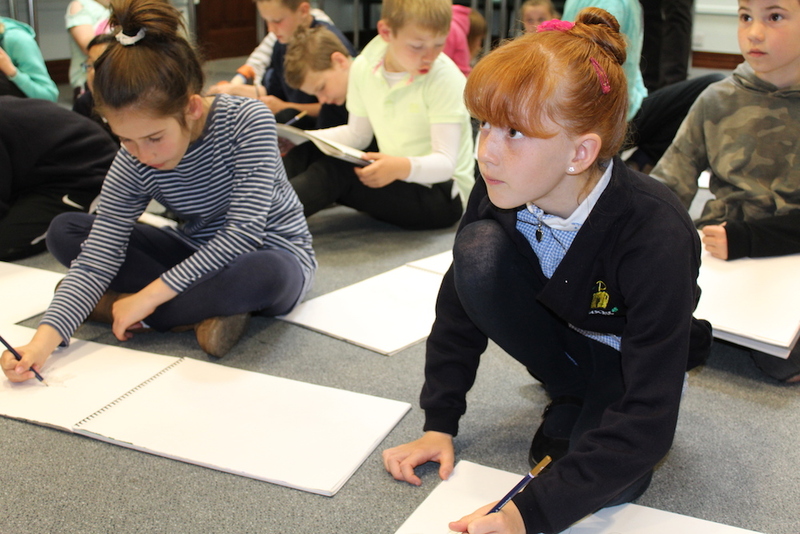 So far this year schools from all over Wales have been visiting the National Library to learn more about the artist from Anglesey, like the pupils of Ysgol Trimsaran and Ysgol Mynydd y Garreg, Carmarthenshire. After taking part in the Kids in Museums Takeover Day in January, they returned in May to enjoy the Kyffin exhibition and workshop. Children emulating one of Kyffin Williams' sketches. 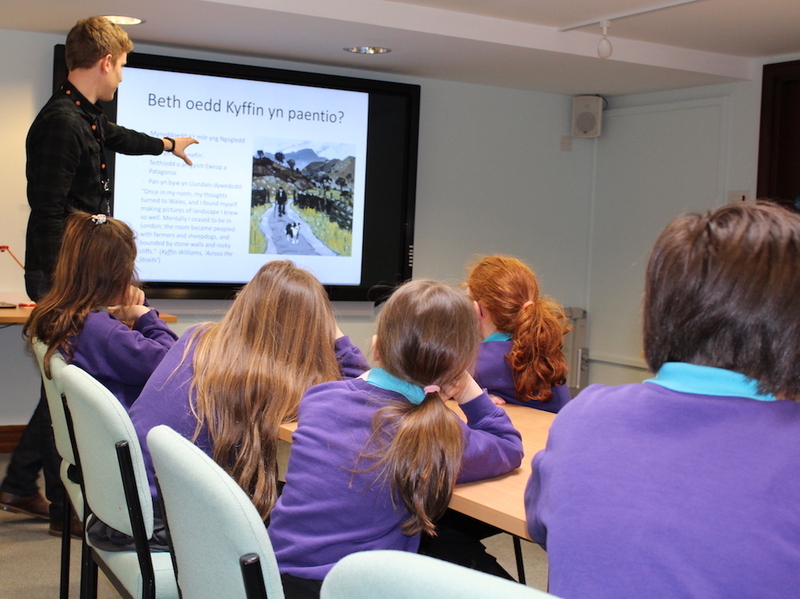 Children learning about the life and history of Kyffin Williams. In April a selection of original paintings and drawings by Kyffin Williams were transported from the Library’s storage facilities to Penygroes, Gwynedd, as part of the Class Art project. Workshops on Kyffin’s style and painting technique were led by two leading Welsh artists in two schools; Catrin Williams studied some of Kyffin’s landscapes with the Year 4 pupils of Ysgol Bro Lleu, and Eleri Jones delivered a session on Kyffin’s portraits for Year 12 students at Ysgol Dyffryn Nantlle, to support them with their A Level course work. Welsh artist Catrin Williams studied some of Kyffin’s landscapes with the Year 4 pupils of Ysgol Bro Lleu. Eleri Jones delivered a session on Kyffin’s portraits for Year 12 students at Ysgol Dyffryn Nantlle. 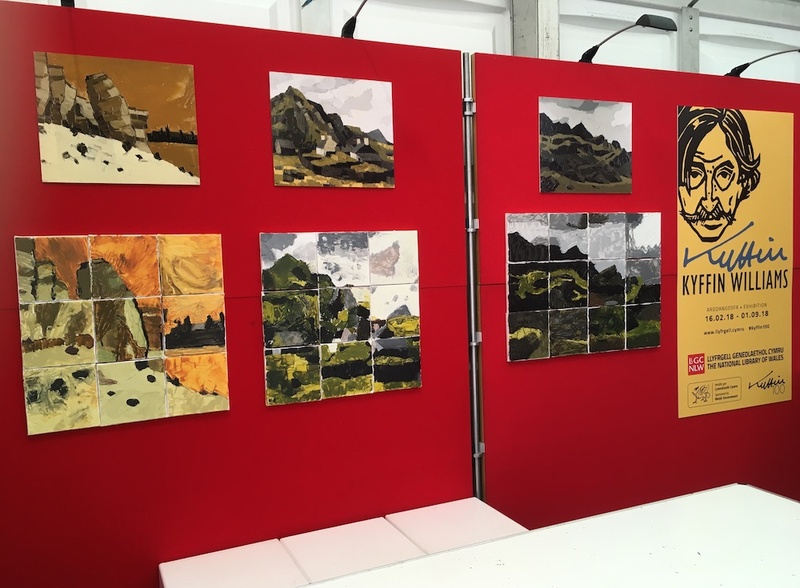 Kyffin Williams was also the theme of The National Library of Wales’ stand at this year’s Urdd Eisteddfod in Llanelwedd. Throughout the week a small exhibition about Kyffin’s life and career provided a backdrop to art activities where young visitors were given an opportunity to emulate the artist by reproducing sections of one of his landscapes in acrylic paint on canvas. During a workshop on the Tuesday, under the guidance of artist Catrin Williams, children were shown how to produce pastel drawings in the style of Kyffin Williams. Some of the work produced during these sessions will be exhibited in the Library’s Education Room until September. A chance to recreate one of Kyffin Williams' masterpieces using thick paint and palette knives. 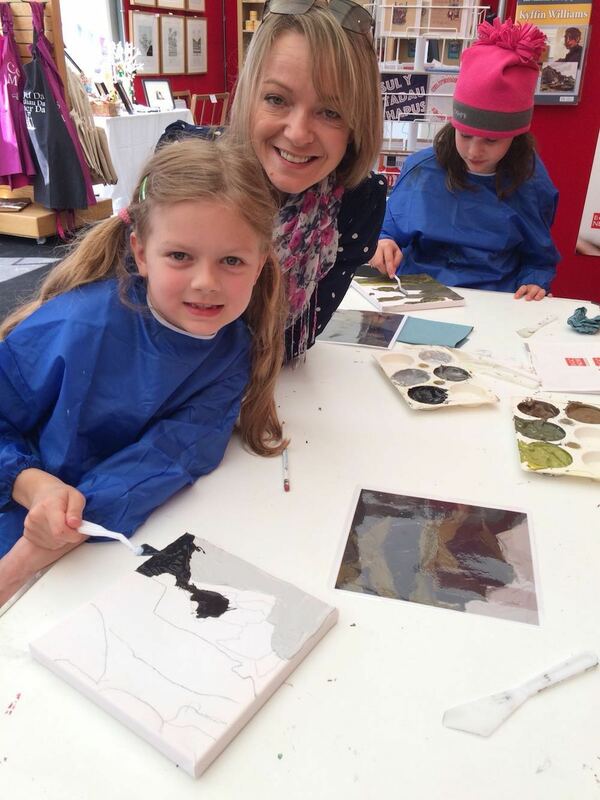 Children at Eisteddfod yr Urdd enjoyed emulating Kyffin's impasto technique. 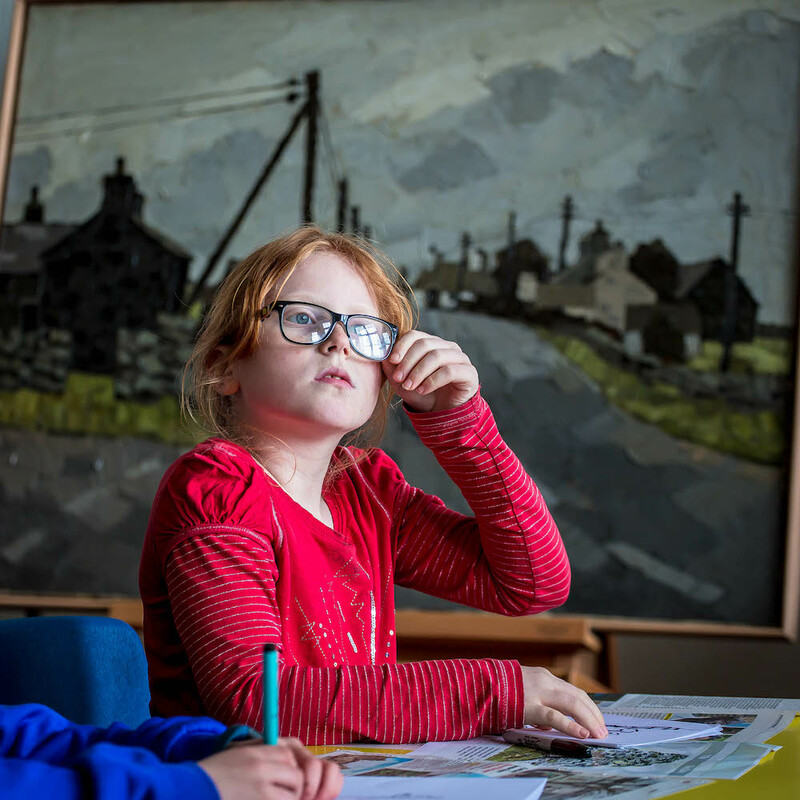 Kyffin Williams: Behind the Frame runs until the 1st of September in the Library’s Gregynog Gallery, and the exhibition includes tasks for visiting families – why not have a go at our ‘Kyffin Quiz’ and create your own masterpiece. The Lifeboat Station Project is photographer Jack Lowe’s mission to record all 238 RNLI stations in the UK and Ireland. 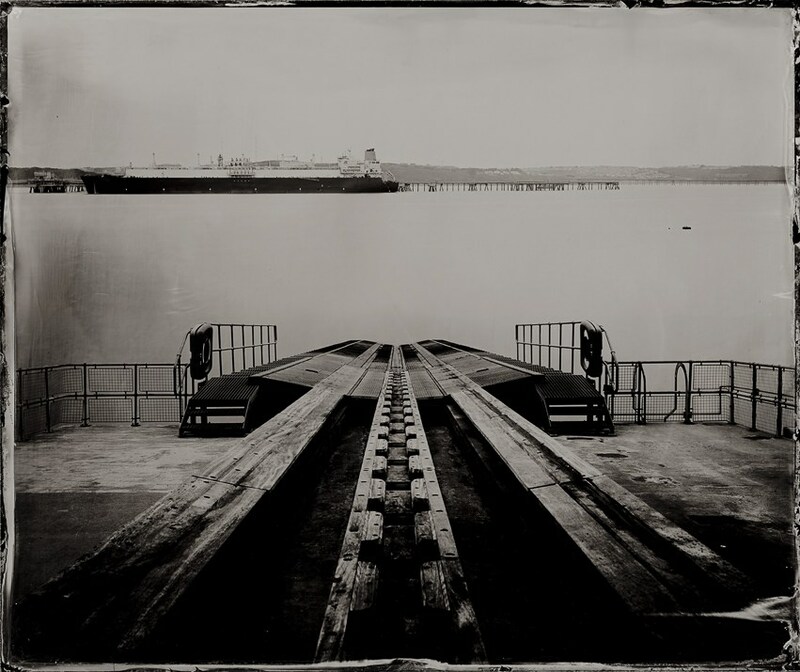 But he’s not doing it with a compact camera swung over his shoulder, but with a large format Victorian one, with which he creates stunning images on glass in his mobile ambulance – a decommissioned Ambulance named Neena! 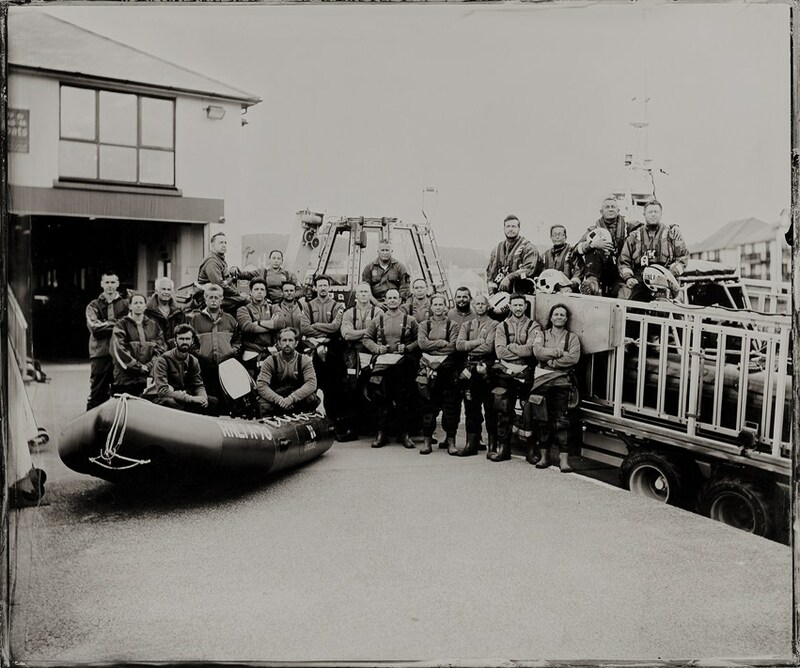 A photographic project of this scale hasn’t been attempted before, although the idea itself stems from an earlier tradition of photographing lifeboat crews. It is Jack’s endeavour to tap into the sense of pride of the unique RNLI volunteers – individuals from all walks of life who give up their time to protect the waters of the British Isles. 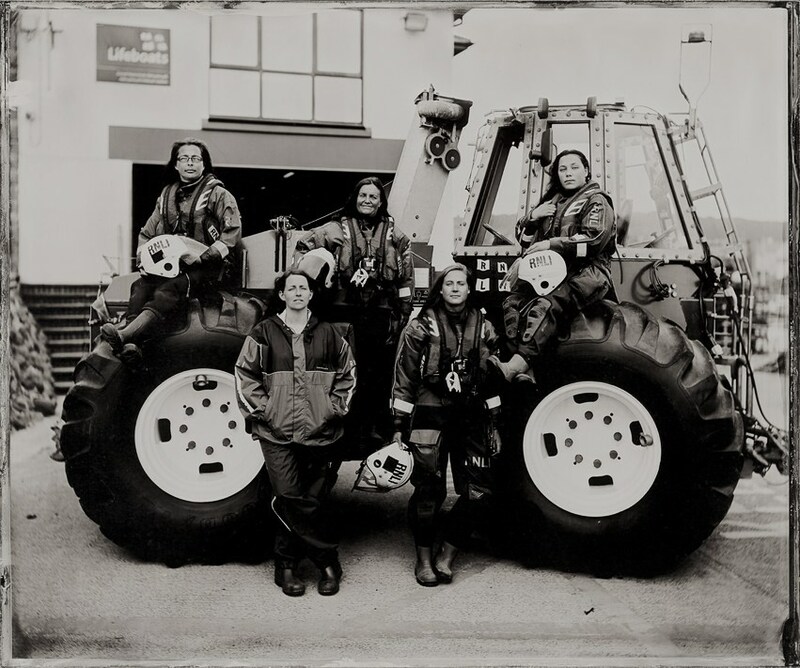 By visiting every RNLI Lifeboat Station in the UK and Ireland, this will result in an unprecedented archive, preserving a vital aspect of the culture of the British Isles for future generations. At the height of his popularity Kyffin was commissioned to paint a succession of portraits, but by his own admission he preferred to turn to portraiture for pleasure. 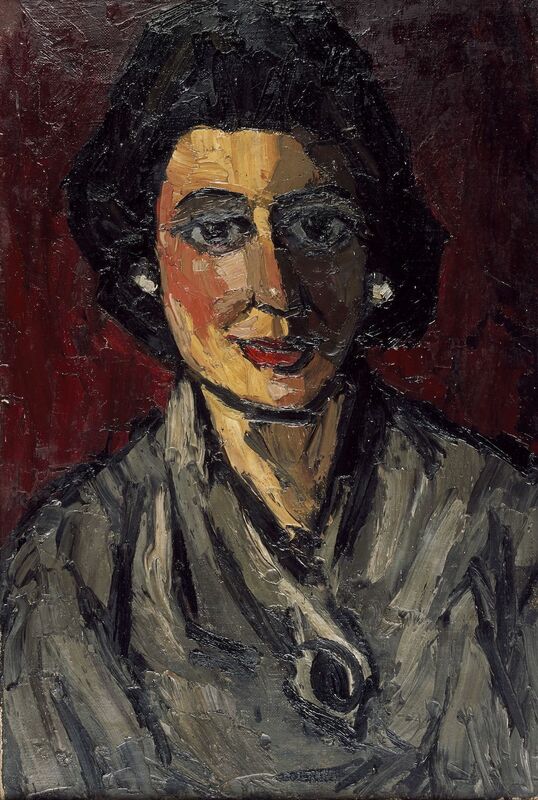 In our current exhibition Kyffin Williams: Behind the Frame, a variety of portraits are shown from the Kyffin collection, ranging from his early life studies created while a student, to the later commissions of an established artist, but more interesting are the portraits which he painted purely for delight. “The reason for this was my use of the palette knife for, painting in broad rough areas of paint; it was difficult to achieve the delicacy necessary”. 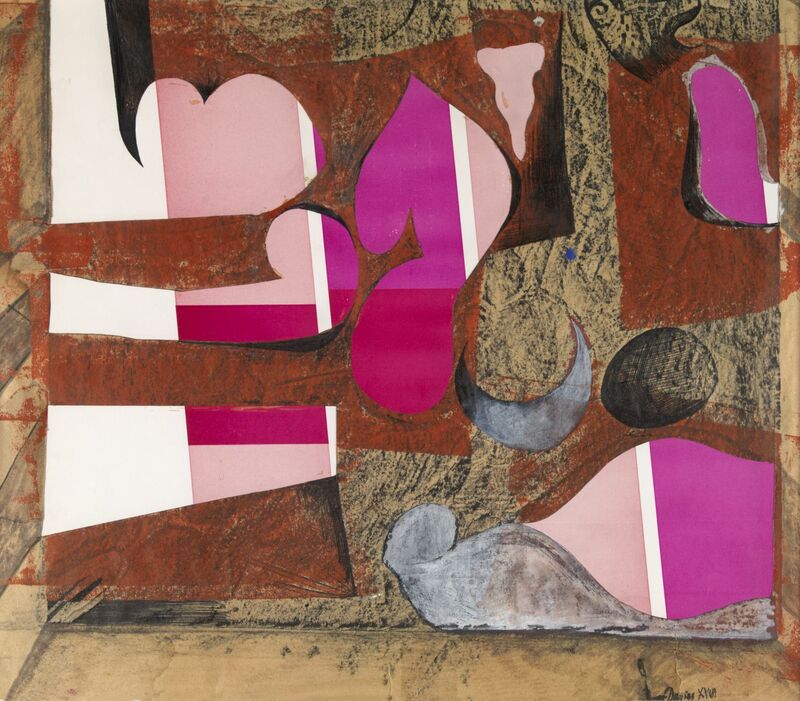 Norma Lopez was a favourite sitter of his in Trevelin while he visited Patagonia in 1968/69. Kyffin described Norma as an excitable girl “smiling through two large brown eyes”. Norma, who was about 8 years old, loved to tease the artist and when not playing with her brother Paulino enjoyed sitting for her portrait. 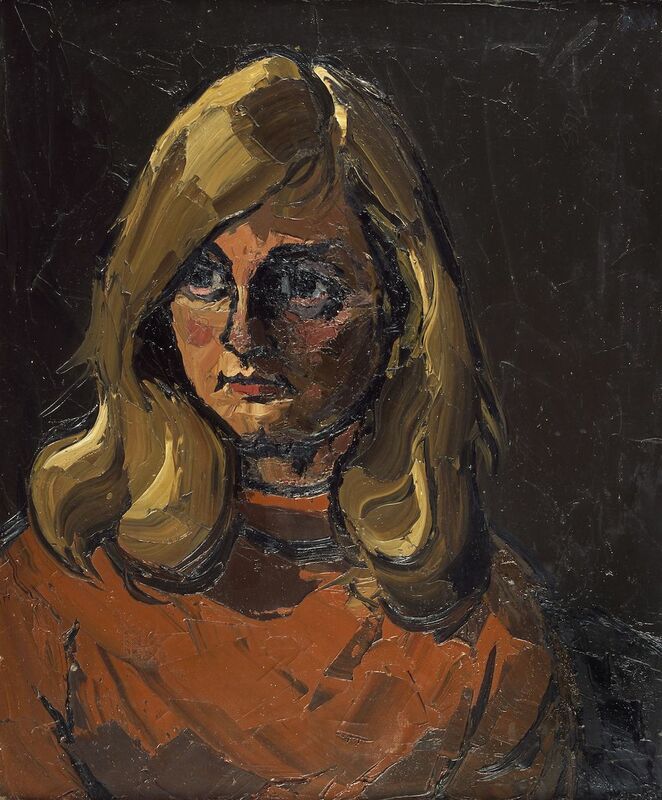 Kyffin painted her several times, but could never paint her in oils once back in London as the paint didn’t capture her fun and light character. 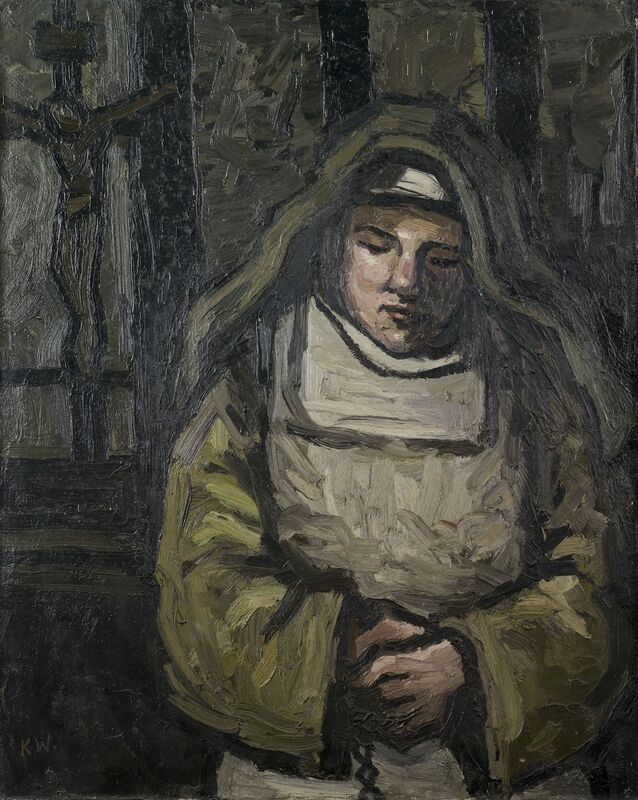 Kyffin was obsessed by people, the people of his native Anglesey, the ones he observed as a young boy visiting parishioners with his cleric father. That probably explains why he often turned to portray the people around him, like the sketch “Woman with Duster” held in the collection (finished paintings Mrs Hughes (private collection) and Mrs Rowlands (Anglesey County Council)). 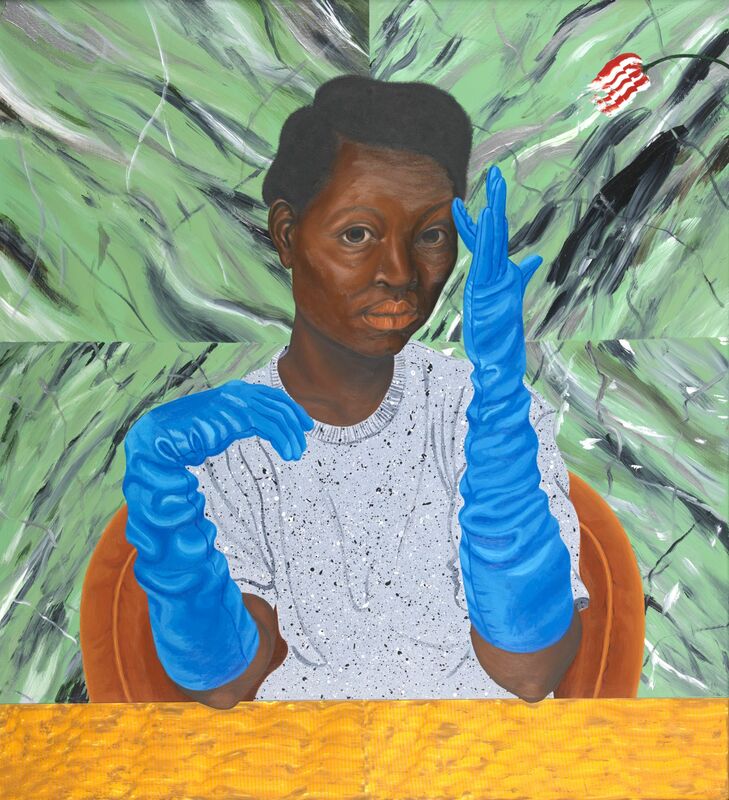 She’s a composite portrait of many women the artist had known on the island who would patiently and cheerfully go about their cleaning duties. Kyffin’s paintings are full of emotion, while working on a portrait he’d be happy to catch the likeness of his sitter but just as important was the mood the work would convey, preferring to catch melancholy rather than a smile. In his portrait of Miss Parry he depicts old age and what he summed up as the feelings and thoughts of an older generation “tired and waiting for rest”. There’s a chance to enjoy these portraits on the walls in Gregynog Gallery until 1st September 2018, come in to see the anonymous nun, Michelle, Norma Lopez, Miss Parry and many more. The Library is buzzing with activity today as we launch our new exhibition Kyffin Williams: Behind the Frame. So what can you expect? There are 4 themes in the exhibition ‘Self’, ‘Artist’, ‘People’ and ‘Places’ which is situated in the Gregynog Gallery and Annexe on the second floor of the Library. The artist himself will guide you through the show as many of his own words taken from his diaries, letters and publications are placed around the exhibits. For those who want to delve deeper there is an opportunity to scan selected paintings using the Smartify app; the Library and Oriel Ynys Môn are the first institutions in Wales to use this new technology. Upon entering, you will be confronted with a miscellany of Kyffin’s image in various guises, from the early sketches of the pensive young man to the more confident older artist whose eyes gaze directly into your own in an almost challenging way. 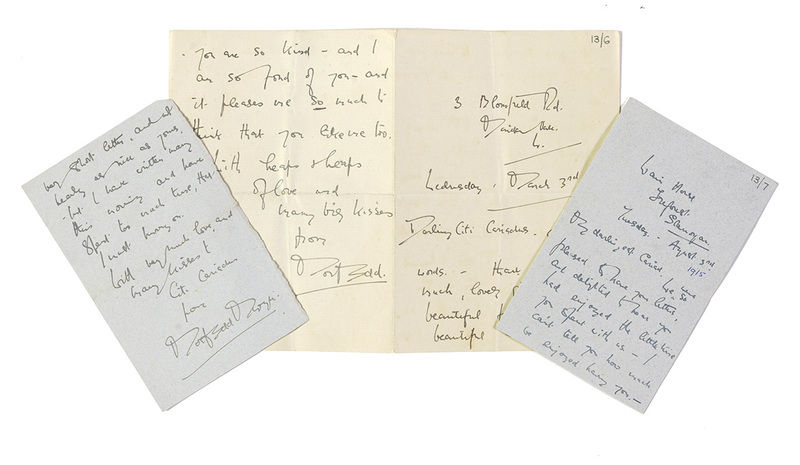 Diaries and letters delve deeper into the character of the artist, one of the highlights being a particularly endearing letter he wrote to his ‘Mummy & Daddy’ when he was at boarding school in Trearddur. In ‘Artist’ you will see the making of Kyffin and his life-long influences, especially his association with Van Gogh and the parallels he drew with his fellow epileptic. 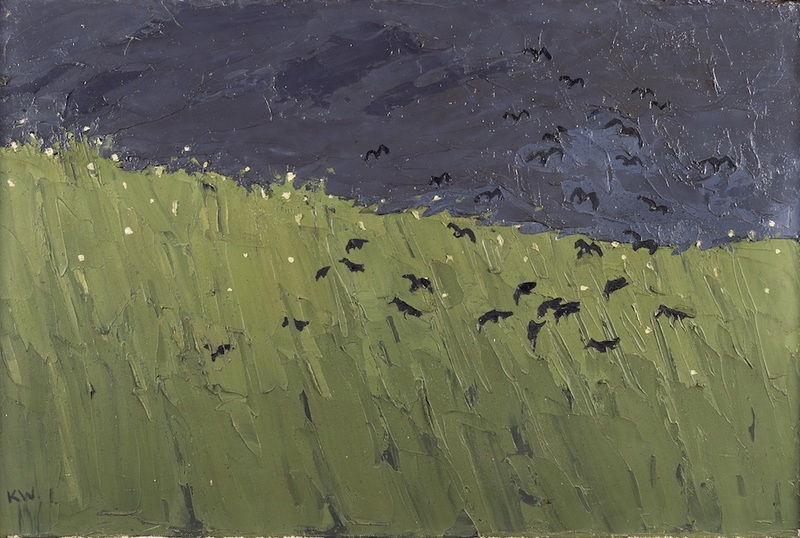 His paintings, ’Sunflowers with Mountains Beyond’ and ‘Crows and Storm coming’, are of particular note, the latter often thematically compared to one of Van Gogh’s most famous works ‘Wheatfield with Crows’, in which Kyffin mimics Van Gogh’s strong colour combinations and the menacing sky which is said to signify the artist’s loneliness. Some of his early works from his time in the Slade are uncharacteristically ‘Kyffin’ but a fascinating insight into how he perfected his craft. Turn the corner and you immediately feel as if you are being watched by the many eyes in Kyffin’s portraits. His placement of the sitter on his canvases is intentional and intriguing. Kyffin mentioned in his book ‘Portraits’: “The placing of the head within the confines of the canvas can show the personality of the sitter.” Indeed, the larger more confident subjects fill the canvas and look directly at you, whilst the more timid and neurotic subjects tend to be placed to one side and looking away. Our favourite is Miss Parry; a partially invented character representing his fascination with old age, “especially those who sit and wait for the end to come”. Although he never saw himself as a traditional portrait painter, Kyffin was obsessed with people. He once said: “I feel that the land and its people are almost part of me”. Kyffin grew up among the hills and valleys of north Wales and was drawn to the landscape and its people, especially the figure of the farmer whom is constant in his work and adorns many living rooms and gallery walls. There are a few of his best examples in the exhibition. 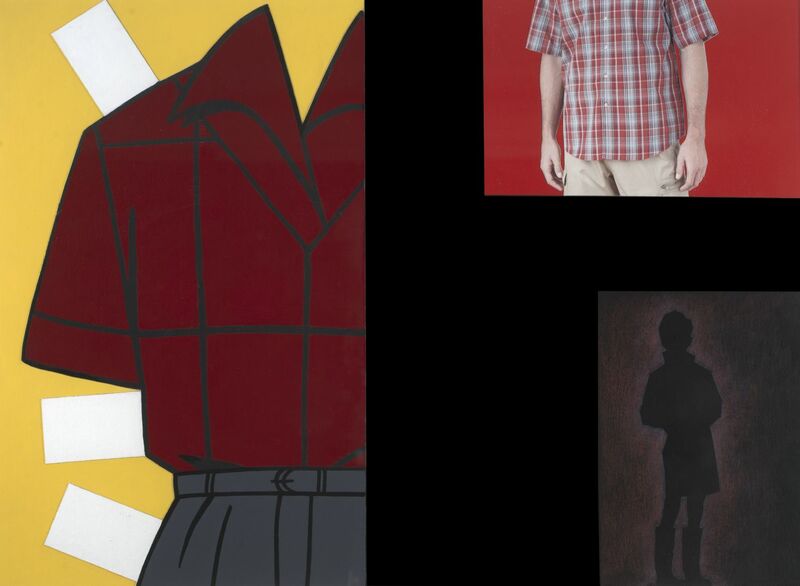 ‘Places’ is the largest and most significant theme in the show. His work in this genre was so prolific, it was very difficult to boil it down to fit into the space; but with a little help from Kyffin himself (he often listed his favourites in interviews and in his diaries) we have tried to represent the very best of his of works inspired by the mountains and seascape of Wales and beyond. 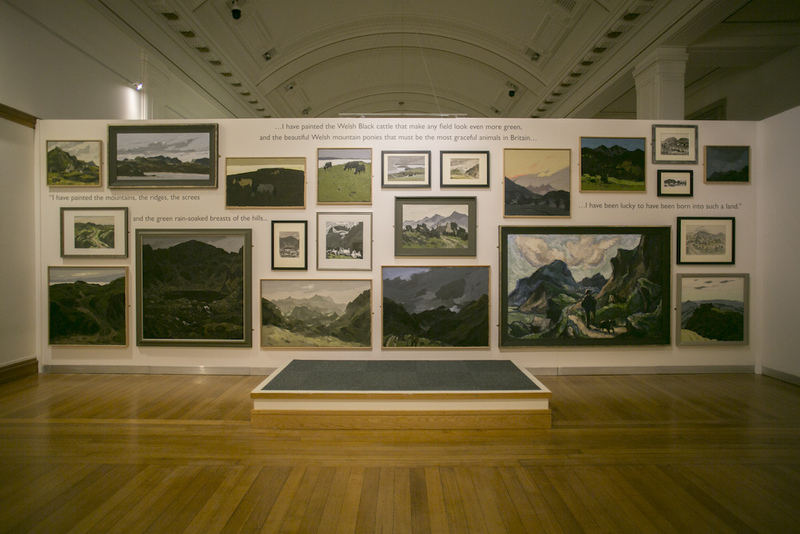 The large Welsh landscape wall which is hung in a salon style as an acknowledgement to the artist’s appointment as a Royal Academician in 1973 is a fitting finale to the exhibition. A challenging hanging method never before attempted by our team, but has been our personal highlight of the whole exhibition. It has been some 13 years since we last dedicated an exhibition to Kyffin and we do hope that you will enjoy the experience and find some favourites of your own…maybe even be inspired to try your hand at creating your very own masterpiece! 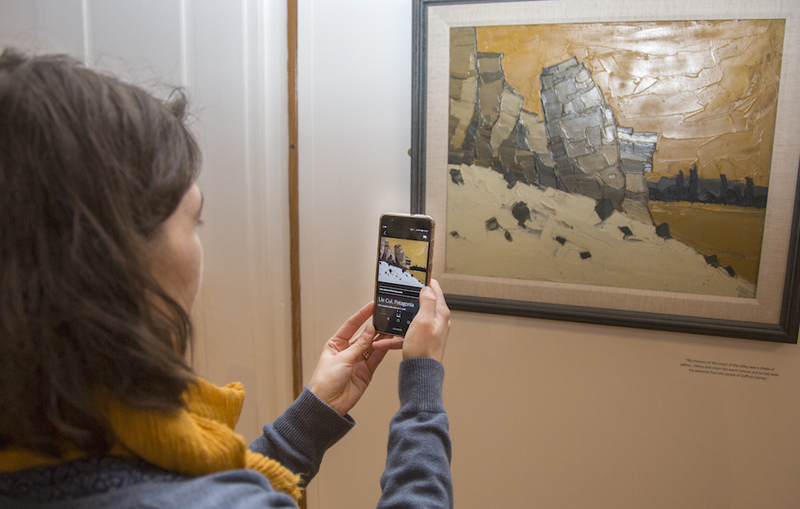 Do let us know what your own personal highlights are on social media using #Kyffin100 [Twitter: @NLWExhibtion] and remember to download the Smartify App before your visit.